This is an old hut I built 2 years ago and have since demolished. It was a 2 m square floor with wattle and daub walls 1.5 m high topped with a pyramidal roof thatched with Alexander palm fronds. The building method is my usual plan- get a roof up first then build the walls. From start to finish it took 27 days (it could have been faster though- this was at a casual speed). This was the first wattle and daub hut I built and is larger than the other one I built later (my idea for now is to build small but well although I’ll try larger huts again in future). 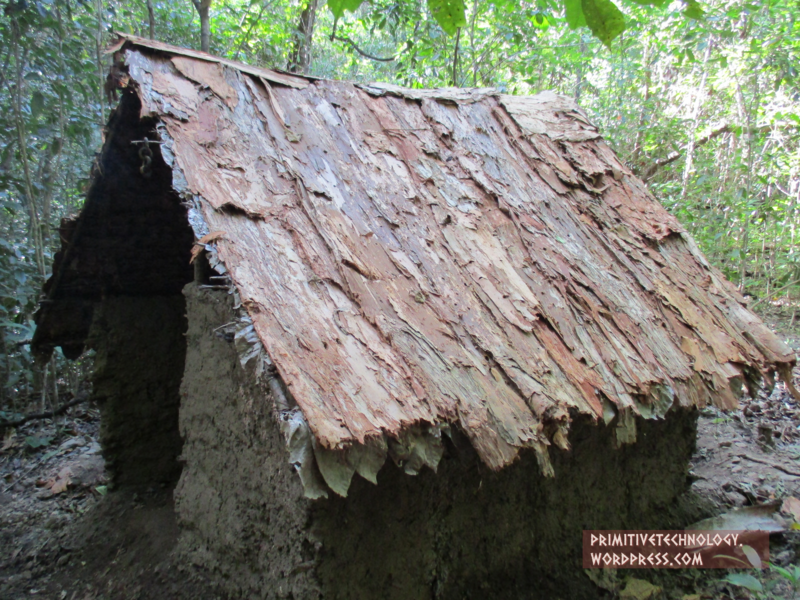 The roof lasted for a few months before becoming rotten and bug eaten. As an important note the species of palm used in thatching makes all the difference. Had this hut been built in the mountain with wait-a-while palm fronds it would have lasted 2 years at least. Instead it was thatched with alexander palm fronds that deteriorated quickly. I wasn’t to know this and was trying to adapt hut building practice I learned in the mountain to low land conditions (I’ve built similar huts up the mountain with the same roof shape that have lasted a long time). I hope in future videos to explore better roofing options to use in areas like this. Also of interest in the video is another pot I make showing more detail than previous videos. 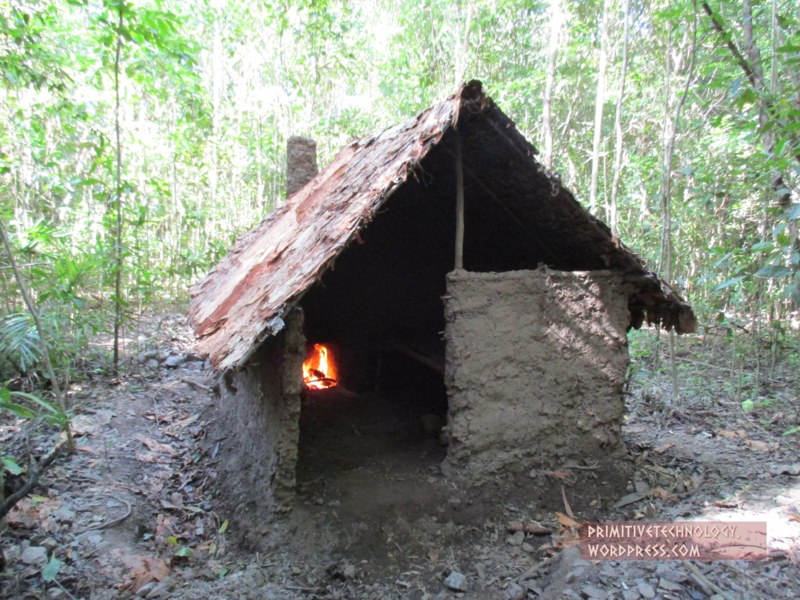 The fire place for the hut is a simple pit in the center of the floor. 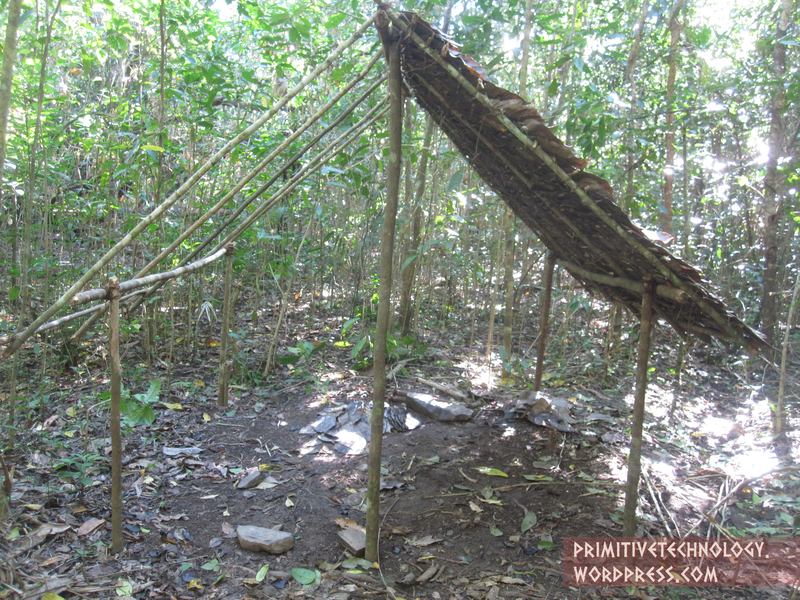 It is a good hut design though it requires a simple ladder to construct. With my dome hut completed I needed to make fire. The easiest method I know is using fire sticks due to their simplicity of construction. A soft wood spindle and baseboard were made of a fast growing soft wood and dried in the sun. Candle nut leaves were used as tinder and a stone flake was used to carve holes in the wood. The spindle was spun between the palms of the hand while the end was in a socket in the base board. The friction caused hot wood powder to fall out of the hole onto a pile of tinder where it ignited. Having made fire I then made a small pot and fired it in the fire pit inside the hut as an experiment. The results showed that soil from the hut site was able to be used to make pottery. I built this thatched dome hut on a mountain ridge using completely primitive tools and materials. The frame was 2.5 m in diameter and 2 m tall. It was made from 8 thin saplings 2.75 m long, the thatching material was split palm fronds and vine was used for tying it all together. A stone hand ax was used to chop the saplings and a sharp stone flake was used to cut fronds. The pointed dome profile is half way between a spherical dome and a ti-pi. This shape sheds rain and funnels smoke effectively while still providing a large inner volume. A moat was dug around the hut to drain water away. As an afterthought I planted sweet potatoes and taro around the moat to hopefully provide some food later on.